TULSA, Okla. — Decades after the 1876 Battle of the Little Bighorn, Stephen Standing Bear, who participated in the tumultuous engagement, recalled its chaos: “I could see Indians charging all around me. Then I could see the soldiers and Indians all mixed up and there were so many guns going off that I couldn’t hear them.” He also illustrated the battlefield as he saw it in large-scale muslin pictographs, with the largest surviving example currently on view in First Person: Remembering Little Bighorn at the Philbrook Museum of Art’s downtown branch in Tulsa, Oklahoma. 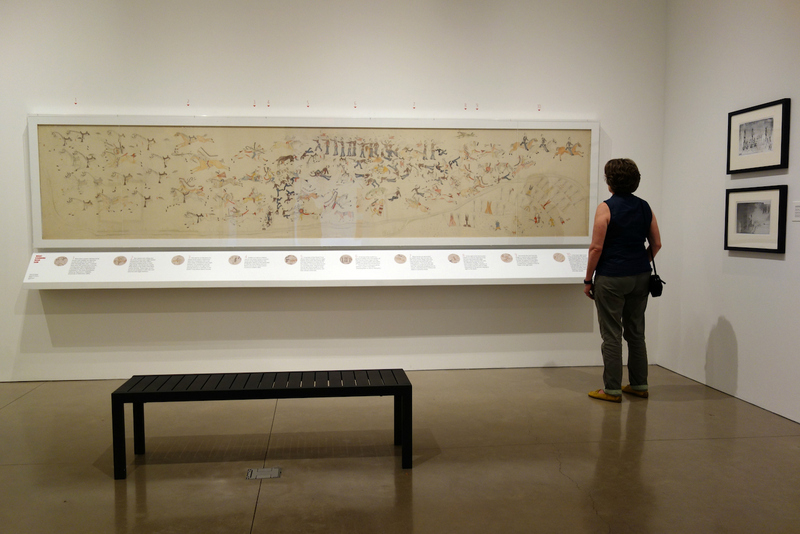 For those who can’t make it to Tulsa, an online interactive allows users to scroll through the muslin and click on points of interest, which highlight this detail of individual warriors involved in the Battle of the Greasy Grass, as it is often called by indigenous people. Two Lakota members of the Stokà Yuhà (Bare Lance) Society hold crooked lances in their right hands, while a member of the Miwátani Society has his red sash staked in the earth, a sign that he was going to stay and fight to the death. A member of the Brave Heart Society is “counting coup” with his eagle feather lance, an act of bravery that required a person to get close enough to hit an enemy by hand. The fall of George Armstrong Custer and his 7th Cavalry to the Lakota, Northern Cheyenne, and Arapaho, was depicted as a romantic tragedy in 19th-century art like Edgar Samuel Paxson’s “Custer’s Last Stand,” where the commanding officer appears spotlit amid the battle. 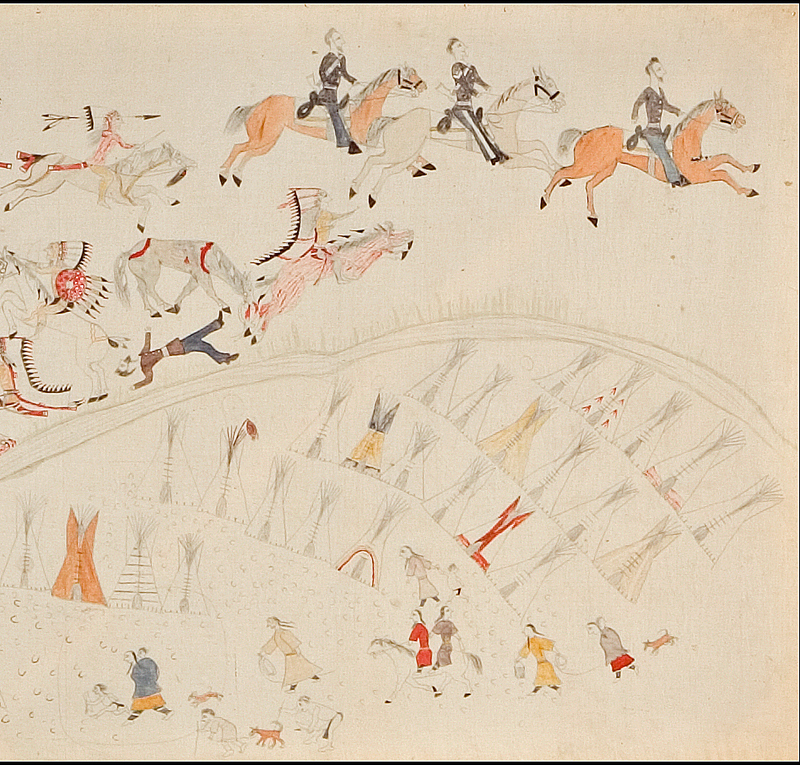 In that painting, like many others from non-indigenous artists, the cavalry soldiers are surrounded by faceless warriors. However, as it was such as crushing defeat (and the most famous Army survivor was the horse Comanche), these were second or third-hand interpretations. 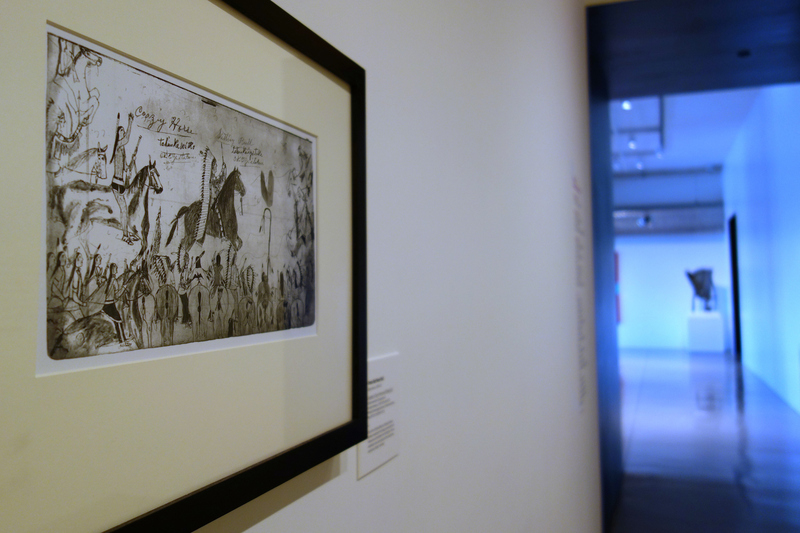 Standing Bear, and artists like Red Horse whose ledger drawings were recently on view at the Cantor Arts Center at Stanford University, were portraying their first-hand experience with the bloody clash. “I think you get a sense of the chaos that was the battlefield, with people on horseback, and some on their feet, arrows and bullets flying everywhere,” Burke said of the muslin. 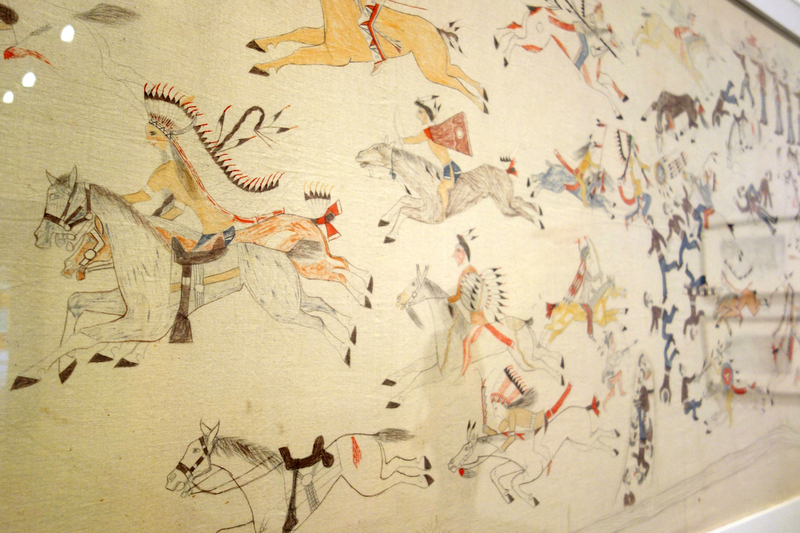 The work had long been in storage at the Philbrook, one of three known Little Bighorn muslins by Standing Bear. In First Person, its return is joined by prints from negatives of drawings by Amos Bad Heart Bull, who was also at Little Bighorn. He drawings were lost, and the glass negatives of them were also believed gone, until they turned up in 2012 at a garage sale. 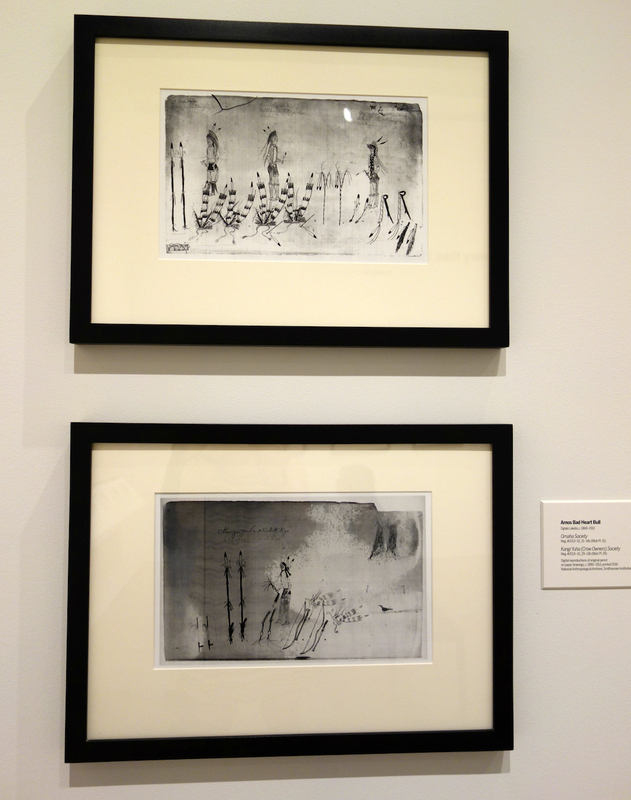 This is the first exhibition to display prints from the negatives, which are now at the Smithsonian Institution. 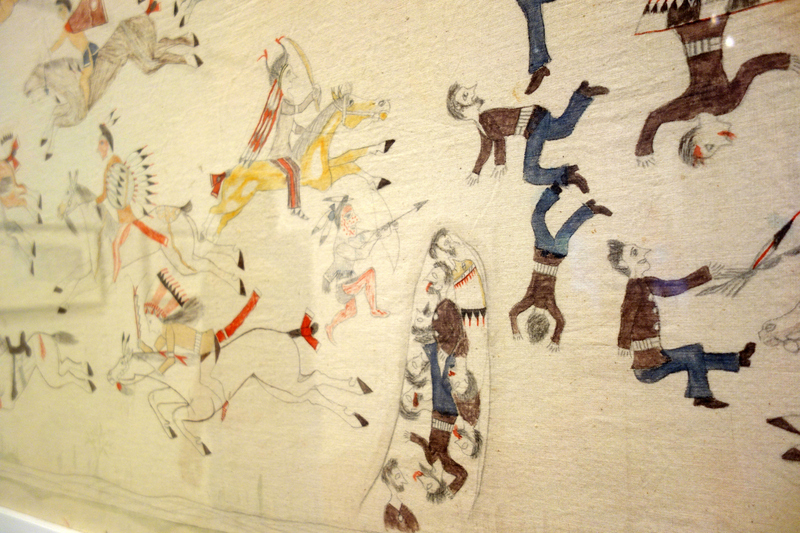 They portray details of Lakota life, particularly the warrior societies highlighted in the muslin panel. But Standing Bear’s panorama isn’t all conflict. In the bottom right corner are lines of teepees and women and children taking shelter from the fray, and this moment is what makes his perspective stand out from many of the images of the fateful battle. Standing Bear recognized the way of life that was under attack, still remembering to include this haunting detail when he created the muslin in the 1920s. 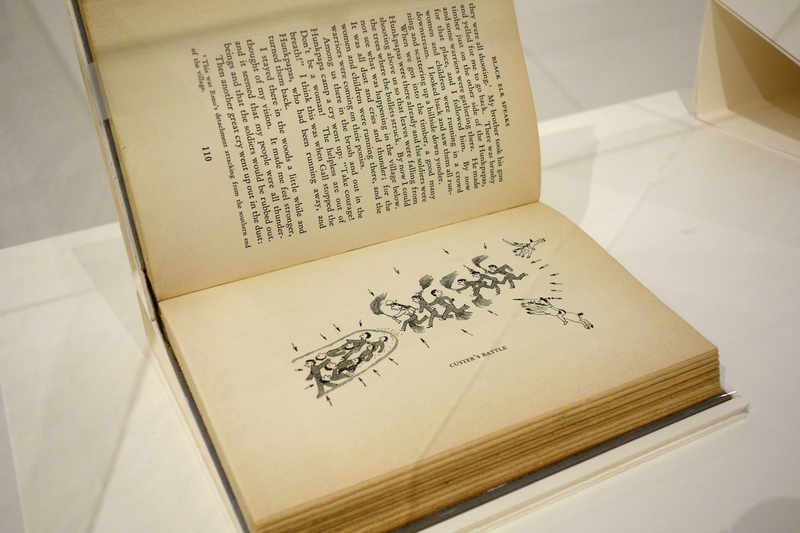 His life would involve a stint with Buffalo Bill’s Wild West Show, illustrating the influential 1932 book Black Elk Speaks, falling in love with a Viennese woman, and returning to live on a South Dakota reservation, but his art would always recall the traditional life of the Lakota. 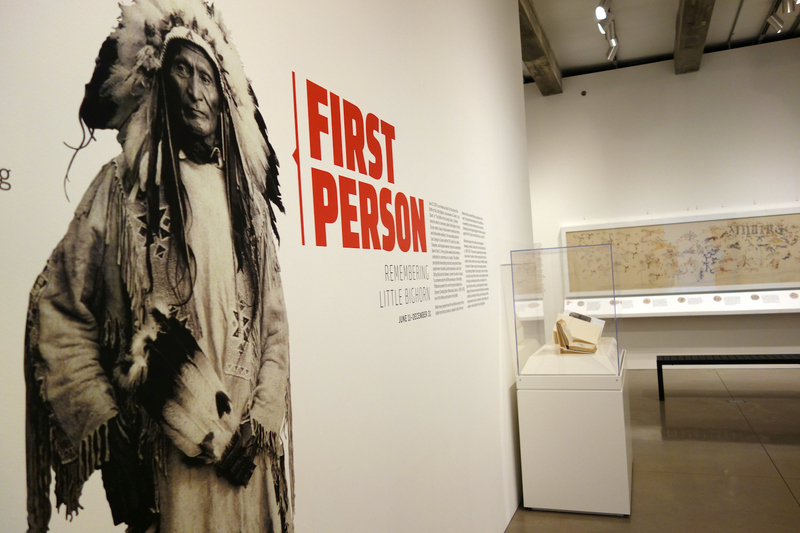 First Person: Remembering Little Bighorn continues through December 31 at the Philbrook Downtown (116 E. M. B. Brady Street, Tulsa, Oklahoma). 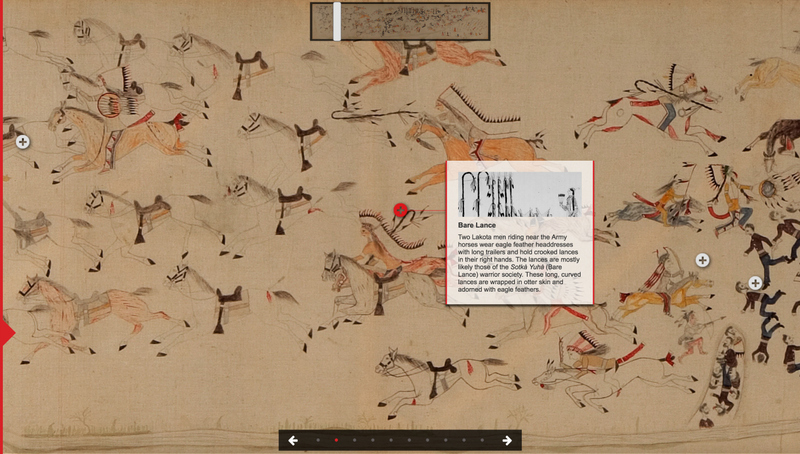 Stephen Standing Bear’s 1920s Battle of the Little Bighorn muslin pictograph is available to explore online.